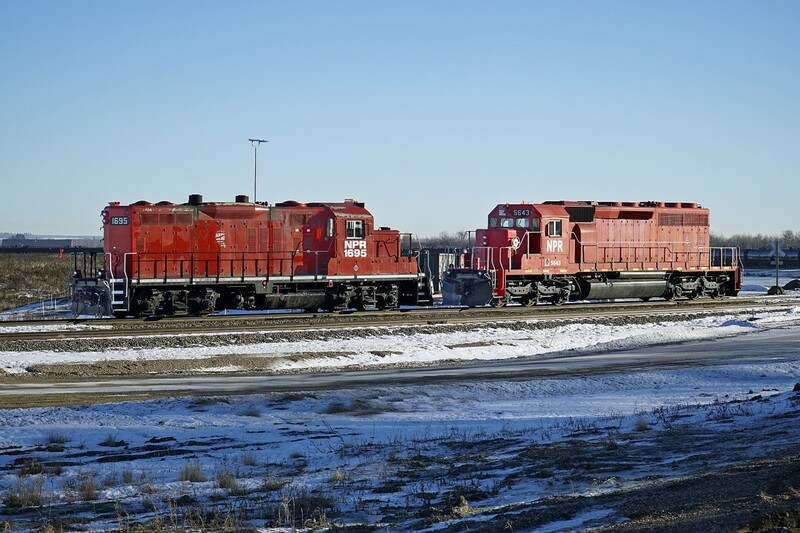 Railpictures.ca - colin arnot Photo: GP9u NPR 1695 and SD40-2 NPR 5643, both ex CP locomotives are seen at the Alberta Midland Railway Terminal in Lamont County. | Railpictures.ca – Canadian Railway Photography – photographie ferroviaire Canadienne. Caption: GP9u NPR 1695 and SD40-2 NPR 5643, both ex CP locomotives are seen at the Alberta Midland Railway Terminal in Lamont County. 1695 was another CP oddball – the rear end of its hood was wrecked in an incident, so they rebuilt it with part of a hood from an earlier GP9 (likely former QNS&L 165 that they had on the property), so it has its normal later 48″ rad fan at the front, and two earlier 36″ rad fans at the back from the donor unit. Are those the same numbers as when they were on CP?